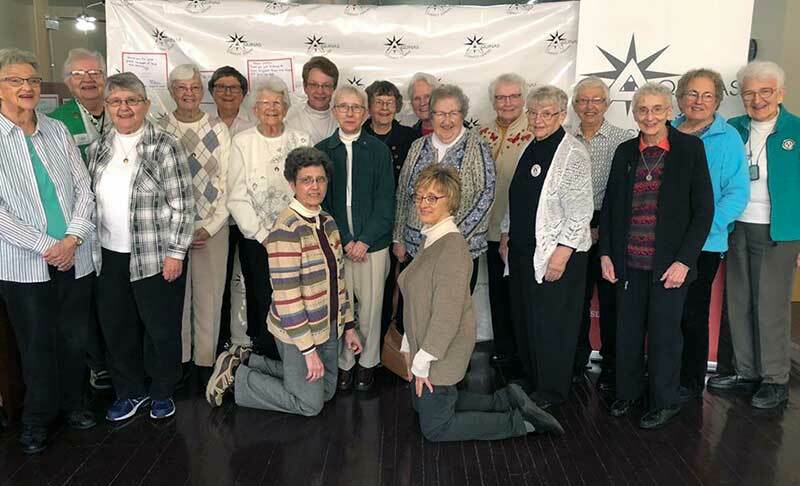 On March 13th, a group of over 40 Catholic sisters and lay people gathered for a brunch to thank the Sisters at Aquinas Literacy Center in honor of National Catholic Sisters Week. After a shared meal, the attendees were presented with the history of St. Dominic by S. JoAnn Fleischaker, O.P. and the significance of St. Thomas Aquinas by S. Joan Mary, O.P. There was also time for sharing stories and memories by the Sisters. The Aquinas Literacy Center has 12 Sisters from sixdifferent religious orders volunteering as literacy tutors and clerical volunteers. We are so thankful for the legacy of the Adrian Dominicans and, with their help and support, will continue to carry on the work they began over 100 years ago. Aquinas Literacy Center, a nonprofit literacy organization in McKinley Park, is sponsored by the Adrian Dominican Sisters. Without the support of the Adrian Dominicans, Aquinas would not be able to carry out its mission of empowering adult immigrants to learn English and become more engaged in their community.